Do you enjoy winding down after after a long day of University? Do you enjoy painting, knitting, origami, and just generally messing around and making stuff? 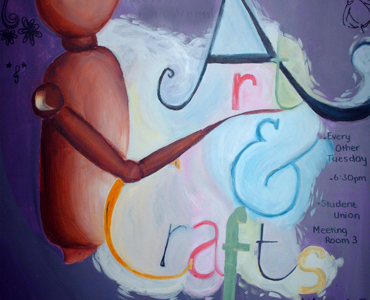 Arts and Crafts Society gives you an opportunity to try the activities you love and learn new crafty skills, all with no pressure and while getting to meet other people on campus! Our sessions are perfect for those wanting to make friends and take some time away from the library. No is no long-term commitment either, just come to the sessions you want! Our sessions are free for members and with membership just costing £4 for the whole year it's very budget friendly. Sessions include all the materials you will need as well as instructions. Only sessions with guests instructors or specialist equipment will require an additional fee (but will let you know well in advance if this is going to happen). To find out more, join our Facebook group (https://www.facebook.com/groups/449504091787996/) or email [email protected] to join our mailing list.